National security advisor (NSA) AK Doval and Chinese state councillor and foreign minister Wang Yi agreed on the importance of approaching the boundary question from the “strategic perspective of India-China relations” and agreed that an early settlement of the boundary question serves the fundamental interests of both countries. A closer developmental partnership between India and China in the backdrop of a disputed border to be kept firmly and decisively peaceful was the focus of the bilateral talks between the two countries on the boundary question on Saturday. National security advisor (NSA) AK Doval and Chinese state councillor and foreign minister Wang Yi discussed and agreed on firming up of “confidence-building measures” (CBMs) between the two militaries to ensure a peaceful border at 21st round of talks held in the southwestern city of Chengdu. Importantly, the two top officials talked about “predictability” in managing the 3,488-km long disputed border and maintaining strategic communication to keep it peaceful. No more military standoffs like the one in Doklam (Donglang in Chinese) near the Sikkim border in 2017 seemed to be the underlined understanding between the two parties: A peaceful border until a permanent solution means calmer diplomacy, which could then be directed to look at common goals and iron out differences in other spheres. An official statement issued by the Indian embassy at the end of the day-long talks between Doval and Wang gave little details about the nitty-gritty of the exchanges – what it did provide was a broad sense of the talks and the current status of ties. “The Special Representatives agreed that pending the final resolution of the boundary question, it is important to maintain peace and tranquillity in the border areas and to ensure that the boundary question does not affect the overall development of the bilateral relationship,” the statement said. Doval and Wang are the designated special representatives (SR) under the mechanism put in place in 2003. “Acknowledging the importance of predictability in border management, and in that context, underscoring the importance of maintaining strategic communication at all levels, the SRs held discussions on various confidence-building measures to promote exchanges and communication between their border personnel,” the statement said. Doval and Wang agreed on the importance of approaching the boundary question from the “strategic perspective of India-China relations” and agreed that an early settlement of the boundary question serves the fundamental interests of both countries. A statement from the Chinese foreign ministry echoed the consensus. “Before the final settlement of the border issue, we will jointly safeguard peace and tranquillity in the border areas between the two countries,” the statement said. “The two sides agreed to implement the important consensus of the leaders of the two countries at all levels, including the frontline forces, to further improve the construction of trust measures in the border areas, and continue to strengthen communication and coordination between the border departments,” the Chinese foreign ministry statement added. Doval and Wang directed the Working Mechanism on Consultation and Coordination for Border Affairs, the bilateral mechanism that focusses on keeping the border peaceful, to work out further details in this regard. “The accepted solution to the border issue sends a positive signal to the outside world that the two ancient civilisations of India and China are wise and capable of peacefully solving problems through dialogue and consultation,” Doval was quoted by the Chinese foreign ministry as saying. 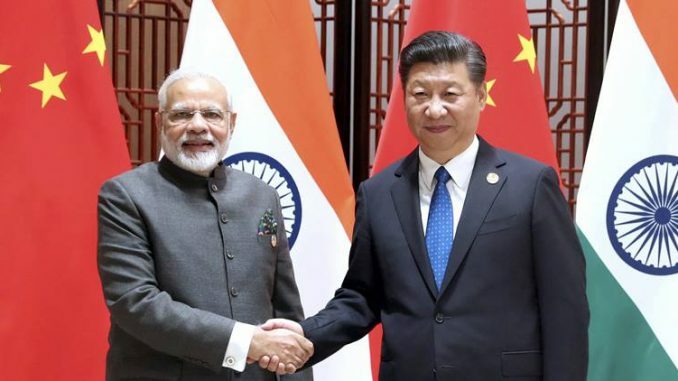 The ministry quoted Wang as saying that president Xi’s three meetings with Modi, especially the Wuhan meeting, has provided a strategic lead for the development of Sino-Indian relations. “The relationship between the two countries is showing an all-round improvement and development momentum. It is necessary for the two countries’ special meeting mechanism to keep up with this positive trend, show new weather, embody new actions, and create more favourable conditions and environment for bilateral relations through constructively promoting border negotiations,” Wang was quoted as saying. Interestingly, the phrase that was used twice in the statement from India to describe current bilateral ties, or even a goal for the near future, was “closer developmental partnership”. “The talks were constructive and forward-looking, and focussed on taking forward the India-China Closer Developmental Partnership in pursuance of the guidance provided by Prime Minister Narendra Modi and President Xi Jinping at their Informal Summit at Wuhan in April 2018,” it said. “The two Special Representatives underlined the importance of sustained and effective implementation of the directions given by their leaders with a view to further strengthening the Closer Developmental Partnership between India and China to mutual benefit and with due respect for each other’s sensitivities, concerns and aspirations”. The phrase close developmental partnership wasn’t used for the first time: President Xi spoke about it when he visited India in September 2014. It was also part of the joint statement released after his visit and has been used since. The reiteration of the phrase in this statement indicates that the two countries are hoping to further joint developmental goals.